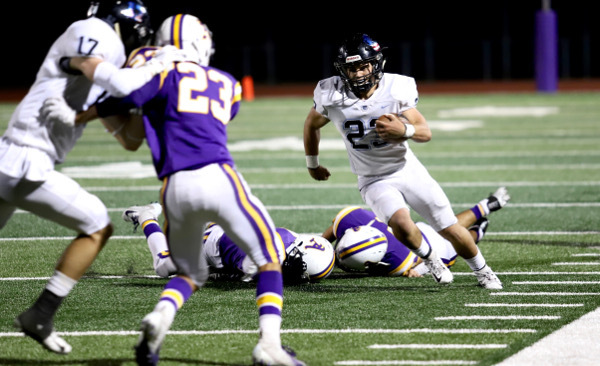 Blue Valley North quarterback Graham Mertz returned a week earlier than initially expected and led the Mustangs to a 42-16 win over Mill Valley. Blue Valley North scored 35 points in the first half in taking control. Mertz passed for 225 yards and four touchdowns in his return. Mertz threw two touchdowns to Cameron Burt and one each to Amauri Pesek-Hickson and Ammon Thutmosei. Pesek-Hickson also rushed for 72 yards and two scores. Mill Valley running back Cameron Young also returned from injury and led the Jaguars with 139 rushing yards and a touchdown on 24 attempts. Ty Black threw two touchdown passes to lead Shawnee Mission Northwest to a 20-2 victory over Lawrence. The Cougar quarterback threw touchdown passes to Justin Mitchell and Dale Talley, III, while Ty Lindenman completed the SMNW scoring with a 22-yard run in the fourth quarter. Black passed for 122 yards and Lindenman rushed for 93 yards. But the story was the Cougar defense that limited Lawrence to 58 rushing yards on 41 attempts. Blue Valley rolled to a 49-7 win over Blue Valley Northwest. Quarterback Walker Kinney completed 15 of 20 passes for 340 yards and four touchdowns to lead the Tigers. Cameron Green caught four passes for 106 yards and two scores, while Beau Palmer’s two catches spanned 93 yards with a touchdown. Palmer also rushed for a pair of scores. Garden City used another strong first half in building a 25-0 halftime lead in beating Liberal, 32-6. Carlos Acosta threw three touchdown pass in the first quarter – two to Tye Davis and the other to Kaleb LaPointe. Avery Arana added a touchdown run before halftime and Reece Morss scored in the third quarter to complete the scoring for the Buffs. Acosta passed for 241 yards and added 86 yards on the ground. Newton shut out Hutchinson in the second half to rally for a 42-35 win. The Railers outscored the Salthawks 21-0 in the second half to pick up their first win over Hutchinson since 1999. Newton quarterback Colton Davis rushed for 241 yards and six touchdowns in the victory. Davis also passed for 133 yards on 15 of 21 completions. KC Schlagle scored 46 points in the first half in rolling past KC Harmon, 52-12. The Stallions led 18-6 after the first quarter before putting up 28 points in the second quarter. Harmon has now lost 26 consecutive games since their last win on October 2, 2015. Olathe West picked up its first win in school history with a 40-14 decision over Shawnee Mission West. Senior quarterback Zac Krause passed for 191 yards, threw three touchdown passes, and was on the receiving end of another touchdown pass from Alex Birge. James Frazier-Baker caught nine passes for 90 yards and two scores, while Jackson Novacek also had a touchdown catch. Sophomore Reggie Dennis rushed for 124 yards and a score and Gavan McDaniel added 99 yards and a score on the ground. Salina Central got a huge night from senior back Taylon Peters on his birthday in beating Haysville Campus, 48-17. Peters rushed for 285 yards and three scores as the Mustangs improved to 4-1 on the season. Peters has now rushed for 981 yards and 13 touchdowns on the season. Wichita Heights defeated Wichita Southeast, 49-14, behind a huge night from senior K’vonte Baker. Baker rushed for 405 yards and four touchdowns on 24 carries as the Falcons piled up more than 600 rushing yards. Joshua Sanders added 139 yards and a score, while Armaad Hubbard rushed for 55 yards and two scores. Baker has now rushed for 1,216 yards and 15 scores on the season. Wichita Southeast was led by Marcivies Grayson’s 135 yards rushing on 17 attempts. Larry Cherry rushed for a touchdown and tossed a 60-yard score to Braxton Davis. Goddard-Eisenhower scored 14 points in each of the first three quarters as part of a 49-29 win over Arkansas City. Tiger quarterback Collin Mackey passed for 215 yards and two touchdowns and rushed for 125 more yards on just nine attempts. Parker Wenzel added 94 yards and a score on the ground as Eisenhower rushed for 320 yards. Colton Mackinnon also rushed for a pair of scores for the Tigers. Cevin Clark passed for 338 yards and three touchdowns, rushed for 157 yards and a score, and kicked a 38-yard field goal for Ark City. Atchison outscored KC Wyandotte 21-0 in the second quarter to provide the separation for a 47-27 victory. The Redmen rushed for 349 yards in the game led by senior Sercy Dunncan’s 158 yards and four touchdowns. Quarterback Braydon Dame added 77 yards and a score on the ground, while Xavier Cushinberry rushed for 76 yards and a touchdown. Wyandotte was led by junior Rashad Graves’ 115 rushing yards and two scores on 18 carries. Matt Campbell passed for 268 yards and a touchdown as Fort Scott topped Labette County, 21-6. Campbell’s pass to Alec Michaud turned into a 70-yard touchdown in the first quarter and gave the Tigers a 1-point lead they would not relinquish. Michaud added a touchdown run in the fourth quarter. Labette County quarterback Easton Dean, an Iowa State commit, passed for 222 yards and rushed for 56 yards. Wellington went on the road and posted a 38-7 victory at Rose Hill. The Crusader defense held the Rockets to 62 yards of total offense and blocked a punt for a safety to start the scoring. Michael Ledbetter rushed for a pair of short touchdowns and threw a touchdown pass for the Crusaders. Zander Vargas led Wellington with 102 yards rushing and a touchdown. Mulvane held off Coffeyville-Field Kindley 28-20 in a non-league game in Class 4A. After Coffeyville took a 14-7 lead in the second quarter, Mulvane scored 21 consecutive points to lead 28-14. Mulvane quarterback Tab Creekmore threw for 106 yards and two touchdowns and Cole Diffenbaugh rushed for 164 yards and two scores. Coffeyville’s Jaylen Logan threw a pair of touchdown passes in the first half and scored on a short run in the fourth quarter. Logan passed for 228 yards and added 94 yards rushing. El Dorado stopped Towanda-Cricle’s momentum with a 34-14 victory. Senior Braden Morgan rushed for 208 yards and two scores and Cody Wittenberg added 184 yards on the ground with two more touchdowns. Circle, coming off its first win since 2016, was led by quarterback Luke Myers who threw touchdown passes to Jake Miller and Jacob Brand. Despite an injury to quarterback Peyton Ortner, Holcomb scored 20 points in the third quarter to rally past Larned, 26-14. The Longhorns trailed 14-6 at halftime before scoring three consecutive times. Backup quarterback Kobe Hands threw a 56-yard touchdown pass to River Amos to pull Holcomb within 14-12. Jacob Henson’s 36-yard touchdown run on the next possession gave the Longhorns an 18-14 lead. Drew Hill’s touchdown run extended the Holcomb lead to 26-14. Topeka Hayden handed Jefferson West its first loss of the season, winning 30-7 at Meriden. The Wildcats scored three times in the first half to lead 19-0 at the break. Rory Annand, Brady Bohannon, and Desmond Purnell scored touchdowns in the first half. Hayden added 11 points in the third quarter via a field goal, a safety, and a fumble recovery in the end zone by Trey Pivarnik. Jefferson West quarterback Cade Ross was held to 93 yards passing after throwing six touchdowns last week. Bryce Clements led the Tigers with 125 yards on the ground. Senior Tate Ahlvers rushed for 264 yards and five touchdowns as Beloit rolled to a 52-14 win over Goodland. Ahlvers did his damage on 32 carries. Hudson Smith added two rushing scores and 38 yards rushing. Clearwater moved to 2-0 in district play with a 49-12 win over Haven. The Indians scored 21 points in each of the first two quarters in taking control. Clearwater held Haven to 93 yards of total offense. The Indians have won two straight and host Wichita Trinity this week before challenging games against Andale and Wichita Collegiate to close out the regular season. Hesston finally appears to be returning to full strength as the Swathers beat Halstead, 38-22. Cameron Cox rushed for 136 yards and three touchdowns and passed for 146 yards and another score. Parker Roth added 189 yards and two scores on the ground. Scott Grider led Halstead with 220 yards rushing and two scores. Fredonia moved to 4-1 with its second straight 7-0 victory with a road win against Cherryvale. Two weeks ago, the Yellowjackets beat Eureka, 7-0. Fredonia has already eclipsed last year’s win total from a 3-6 season and has captured three consecutive victories. Fredonia held a slight edge in total yards, 182-159. Cherryvale had four turnovers with two interceptions and two fumble recoveries. Fredonia’s defense limited Cherryvale to 2 of 11 on third down conversions and scored the game’s only touchdown in the second quarter on a five-yard run. Rossville defeated Southeast of Saline, 32-6, and gave the Trojans their first loss in the first matchup ever between the teams, according to Kansas Football History. Senior Garrett Carver completed 13 of 19 passes for 192 yards with two scores against no interceptions. He rushed 20 times for 82 yards and a TD. Rossville held SES to 7 of 30 passing for 63 yards with zero touchdowns against three interceptions. Junior kicker Joao Lovisi was 2 of 3 on extra points and made 4 of 4 field goals, one off the state record for a single game, according to the Kansas Sports Hall of Fame. He had a long of 35 yards. This season, Lovisi is 5 of 8 on extra points and 5 of 5 on field goals. Lakin earned a 28-6 victory over Southwestern Heights to move to 5-0. The win sets up a key district and Hi-Plains League home contest versus Cimarron (4-1) this week. J.P. Perez returned the game’s opening kickoff for a touchdown. William Gilleland rushed for two touchdowns to bump the lead to 22-0. Kayden Christiansen led the Broncs with 170 yards and a touchdown on the ground. Maur Hill-Mount Academy defeated Horton, 44-12, and moved to 4-1. Junior quarterback Jack Caudle completed 6 of 10 passes for 136 yards with three scores and zero interceptions. MHMA had 37 carries for 207 yards and two TDs. Three players caught touchdown passes. Kaleb Hammeke returned the opening kickoff 90 yards for a touchdown to give Hutchinson Trinity a lead it would not relinquish during a 20-7 victory at Garden Plain. Hammeke then added a short touchdown pass to Nolan Clark for a 14-0 first quarter lead. Aaron Guerrero led the Celtics with 133 yards on the ground and his fourth quarter touchdown put the game on ice for Trinity. Plainville rolled over Republic County, 38-0. The Cardinals had an eight-yard fumble return for a score from Jared Casey. He also rushed for an eight-yard score. Jordan Finnesy twice found Kobe Spiess for touchdowns. Finnesy completed 6 of 11 passes for 168 yards and two scores. Casey had 69 rushing yards. Syracuse defeated Ellis, 28-15, in a home game. The Bulldogs moved to 3-2 and have matched last year’s win total with first-year coach Dustin Doze. Reece Hart tallied 123 rushing yards, and Edgar Gonzalez rushed for 102 yards. Both had one rushing touchdown. Sacred Heart defeated La Crosse, 27-0, in a home contest in a 1A non-conference game. Sacred Heart forced five turnovers. Four of the miscues came in the first half, when Sacred Heart limited La Crosse to 19 total yards. The Knights led 31-0 at halftime. David Anderson completed 10 of 15 passes for 214 yards and four scores, one to four receivers apiece. Trace Leners had three catches for 82 yards, including a 41-yard touchdown reception. Charlie Skidmore enjoyed a big game with two catches for 66 yards, two rushes for 28 yards, two interceptions and a 33-yard field goal. One of his receptions was a 50-yard touchdown. In a unique contest, Pleasanton moved down to eight-man football again and defeated Osceola, Mo., 38-22. The Blu-Jays, in its first year of 11-man football after many years at eight-man, moved to 5-0. Turner Dent had a quarterback sack for a safety and early 2-0 advantage. Blake Pohlmeier had a 24-yard rushing touchdown and intercepted a pass to end the first quarter. Early in the second quarter, Kaden McKee rushed 25 yards for a score, and then found his brother, Kasen, for a 40-yard touchdown inside the final minute of the first half. The Blu-Jays led 24-8 at halftime. Pohlmeier picked off another pass and had another rushing touchdown in the second half. Oberlin-Decatur Community earned a 30-0 victory against Atwood-Rawlins County. Colton Ketterl rushed for 138 yards and a touchdown, part of a big ground attack. Dawson Kempt delivered 16 carries for 79 yards and three touchdowns. Gavon Uehlin finished with 16 carries for 115 yards and a score. The Red Devils (3-2) rushed for 335 yards and have already exceeded their win total from the last two seasons. Oberlin had posted back-to-back two-win years. Ness City beat Kinsley, 46-0, and moved to 4-1. The game ended at halftime. Hector Rodriguez and Edwin Rodriguez each rushed for a pair of touchdowns. Angel Guzman also tallied two rushing scores as the trio had 17 carries for 221 yards. The Eagles have a key game with 4-1 Spearville this week. Hill City defeated Stockton, 51-6. Conner Born rushed for 127 yards and passed for 124 yards. He rushed and passed for pair of scores apiece. Dalen Journigan had a 55-yard touchdown in the third quarter, and Jayce Hamel scored a touchdown and had a field goal. Stockton’s only touchdown came on a 63-yard kick return from Jayce Hamel. Maranatha Academy defeated Chase County, 62-16, behind another massive game from Nate Burdette. He helped the Eagles move to 4-1. The junior completed 11 of 23 passes for 373 yards with eight scores against no interceptions. He also rushed two times for 43 yards and a score. He was one off tying the eight-man single game state record, according to Kansas Sports Hall of Fame statistics. Junior Brock West recorded 11 catches for 373 yards and all eight TDs. West tied the state record with eight receiving TDs, first set by Onaga’s Tyler Herrman in 2016. Through five games, Burdette has completed 65 of 112 passes for 1,026 yards with a 23/5 TD/INT ratio. He has also rushed 35 times for 248 yards and six scores. On Thursday, South Central earned a big 59-14 road win versus Medicine Lodge in District 2. South Central led 32-0 after the first quarter. Junior quarterback Chayde Snyder completed 6 of 7 passes for 154 yards with two scores and rushed 24 times for 109 yards and three scores. Macksville led Moundridge 14-0 at halftime and held off the Wildcats in the second half for a 34-18 win. Karson Waters scored both first-half touchdowns for Macksville on a pick-6 and a touchdown reception from Cody Mead. Skyler Evans rushed for 185 yards and two scores for the Mustangs. Oswego outscored West Elk 48-44 to pick up a key win in District 1. The Indians were led by Jace Wilson’s 278 rushing yards and six touchdowns and also caught a 29-yard touchdown from Isaac Elliott. West Elk, playing without its top two offensive players Nic Moreno and William Silvey, led 30-20 at halftime and 36-34 after three quarters. The two teams combined for three touchdowns in the final 90 seconds of the first half. Sylvan-Lucas delivered a big comeback in a 52-48 home win against Thunder Ridge. Thunder Ridge led 40-24 at halftime and 48-38 early in the fourth quarter before the Mustangs rallied for the win. Both teams are 2-2, 1-1 in district play. Thunder Ridge senior Brandon Grauerholz totaled four touchdowns, including 218 rushing yards and three scores. Senior Caden Bach, playing in place of Nick Stutsman, who missed the game, piloted the Northern Valley attack to a 50-0 win against Wilson. The Huskies moved to 4-1, as Bach contributed five total scores. Ross Cole caught a 45-yard scoring pass, and Alex Van Patten delivered a 20-yard scoring run. Stafford matched last year’s win total from a 4-5 season and improved to 4-1 with a 70-20 victory against Ingalls. The Trojans have already scored 244 points after they tallied 183 last fall. Stafford led 20-8 at halftime before they outscored the Bulldogs 24-12 in the third quarter and 26-0 in the fourth. Senior Caleb Hildebrand had 27 carries for 194 yards and five rushing scores, while senior Justice Manning recorded 23 carries for 138 yards and four touchdowns. Stafford recorded 362 rushing yards. Beloit St. John’s-Tipton won its fourth straight game with a 20-6 victory against Pike Valley. Sophomore Brayden Perez had 18 carries for 151 yards and a score, while senior Kail Dubbert recorded 24 carries for 99 yards and a touchdown. Junior Alex Ketter picked off two passes and Perez had one. Ketter, one of eight-man’s top punters, had all three of his punts land inside the Panther’s 20-yard line. Frankfort remained unbeaten with a 62-14 win over Blue Valley Randolph. The Wildcats were led by Garret Dalinghaus who rushed for 161 yards and two touchdowns. Branden Bussmann added 141 yards and four touchdowns on the ground and also had 95 receiving yards and two scores. Wakefield outscored Hartford 50-40 thanks to a big night on the ground. Skylur Merritt rushed for 149 yards and two scores and Konner Murphy added 121 yards and two more touchdowns for the Bombers. Merritt also passed for 113 yards and two scores. Hartford was led by Dalen Kistner’s 372 passing yards and five touchdowns. Kistner also added 94 yards on the ground with a touchdown. Golden Plains rolled to a 63-14 victory over Natoma to remain unbeaten. Senior back Dylan Spresser rushed for 230 yards and scored five touchdowns on his nine carries. Caleb Korte and Jacob Ritter each added a rushing touchdown as the Bulldogs tallied 377 yards on the ground. Nolan Ritter hauled in two receptions for 76 yards, both of which went for touchdowns.